Heloderma suspectum is a species of venomous lizard. 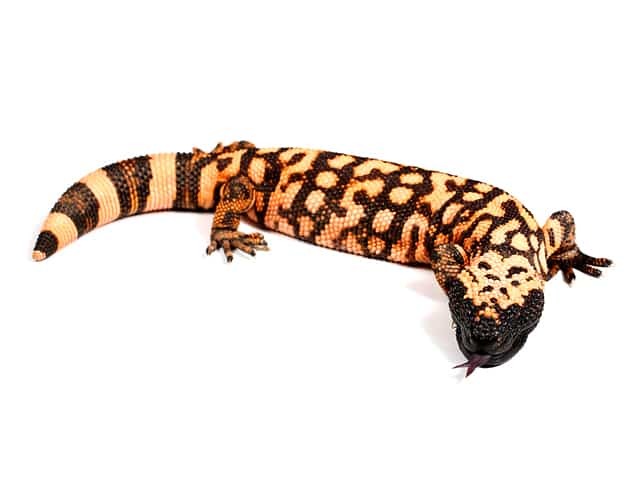 The dorsal coloration of the Gila monster is black with pink or orange. In the southern subspecies, the reticulated Gila monster, the light markings, or bands, are broken up to form a reticulated pattern. In the northern subspecies, the banded Gila monster, the light markings generally form an unbroken band across the back. Though the Heloderma suspectum is venomous, its sluggish nature means it represents little threat to humans but make no mistake, it can bite quickly and hold on tenaciously. Heloderma suspectum are fairly easy to keep. Neonates should be kept in a shoe box rack type system for better monitoring. A good size of enclosure for an adult Heloderma suspectum would be 1.5 x 0.7 x 0.5 meters (5 x 2.3 x 1.6 feet). Stay away from open-mesh enclosures as these lizards must be kept warm and, unless you live in a consistently warm environment yourself, it will be costly and complicated to get such an enclosure heated to the proper temperature. Fresh water is offered daily and must be maintained clean. Make sure that the bowl is big enough so that the lizard will be able to soak inside. Humidity must range between 40-60%. A large water bowl placed in the enclosure will achieve that. I feed all my babies about every four to five days. Pink or fuzzy mice live or dead no matter, as the animal grows i increase the size of the food item. If an animal regurges soak in lukewarm water daily for about one hour (DO NOT FEED !) for seven to ten days then feed a very small meal and work back up. I feed my adult Heloderma suspectum primarily large mice; males once per week and females twice per week. They are Venomous and a bite can cause severe swelling pain vomiting and sometimes loss of bodily functions. Not considered lethal but avoid getting bitten at all costs. When picking up a tame adult lift the tail and slip your hand up under its belly around its front legs. They can whip around up and side to side but not to well down. Sometimes Heloderma get gut problems which can cause them to regurgitate. I use Orbax solution every other day for five treatments along with Metronidazole. This seems to clear most stomach problems up. Illness in Heloderma is very uncommon. Ceftazadime for injection and hydration can also work on sick Heloderma. A little extra heat say 84-88F (29-31C) and hydration are optimal if these things don’t work there’s usually nothing else you can do. That being said Heloderma is a very hardy captive and has few health problems.